Florida is one of the most popular states to visit in the U.S., and with good reason – it’s hard to argue with nearly year-round sun, warm temperatures, and white sand beaches. After exploring all the mainland has to offer, from the Everglades to Universal Studios, it’s time to check out the state’s additional gem a bit farther south: The archipelago of the Florida Keys. When you think of the quintessential American road trip, perhaps images of Route 66 or California’s Highway 1 come to mind. It hardly seems logical that one of the most idyllic places to enjoy the open road is through a body of water. But the 113 miles along the Overseas Highway through the Florida Keys provide a road trip you’ll be talking about for years to come. As you cruise through the Keys (remembering to stick to the right! ), make sure to keep track of the mile markers along the way. You’ll see signs for such creatively titled places as Little Torch Key, Sugarloaf Key, Saddle Bunch Keys, and Little Duck Key. Therein lies the reason why you can’t cover the mileage in one fell swoop – you’ll want to hop out, browse the souvenir shops, and of course sample a slice of Key Lime pie at each of these charming towns. As the mile markers wind down you’ll approach Key West, the southernmost point of the United States and the most well known of all the Keys. Take advantage of the beaches, snorkelling scene, great seafood restaurants and the laid-back, bohemian beach vibe. 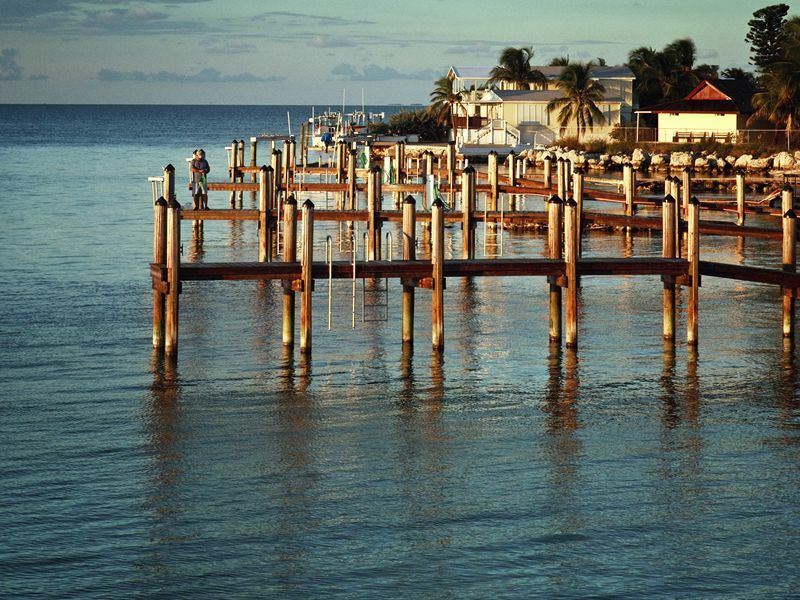 The Keys offer incredible snorkelling, due to the shallow waters and an abundance of coral reefs. In Key Largo, those who like to stay close to shore can spot brilliant fish by snorkelling at Molasses Reef. If you’re looking to head deeper, Key Largo is the diving capital of the world, and there are plenty of diving courses and tours. Due to the lack of waves, the Keys are also a great place to try your hand (and balance) at stand-up paddle boarding. Forget paintings or sculptures, and instead enjoy a museum dedicated to the largest collection of antique diving gear in the world. The Florida Keys History of Diving museum in Islamorada showcases equipment used before our modern fins and oxygen tanks – and if you’ve just spent the day scuba diving, you’ll be glad technology has improved. The Ernest Hemingway House in Key West is another museum worth checking out. It contains the author’s original furniture and belongings from when he resided in the town, before moving to Cuba. For the best hamburger you may ever eat, take a seat at M.E.A.T. Eatery and Taproom in Islamorada. In addition to the juicy patties, sandwiches and duck fat French fries, they make their own condiments (caraway seed beer mustard and mango chipotle ketchup!). Wash it all down with their impressive selection of craft beers. Avoid the tourist traps on the main drag of Duval Street in Key West, and enjoy dinner at Firefly Restaurant, which serves up American Cajun fare. It’s only fitting to try a Cajun twist on Southern comfort food in the southernmost point of the U.S. Traditional entrees like gumbo and chicken and waffles share the menu with bolder options like fried pigs ear and green tomato pie. Key West offers the most varied lodging options of the archipelago. After a day on the road, relax and refresh at the Ocean Key Resort & Spa. Its location is second to none on Duval Street, the main drag of the town and the centre of all the attractions. The hotel even has a sunset pier to ensure a spectacular evening. If you want to stay overnight between the start and finish of your roadtrip, Cheeca Lodge & Spa offers fantastic, high-end resort accommodations. Enjoy access to the resort’s private white sand beach, although two heated swimming pools and a spa are available if you need them as well! More information and to book: Enjoy three fun-packed days with included activities such as cruising in a glass bottom boat, feeding the Tarpons and a visit to the Theatre of The Sea on our Florida Keys Experience tour.